The HLF-funded ‘Inspired by Knole’ Project, 2013-2018 has conservation at its heart. Throughout most of 2016, the Knole set of six Cartoons is being conserved off site. Christine Sitwell, who advises the National Trust on Painting Conservation, describes the national significance of these very large canvases. If we start with the significance to the Knole Collection, which actually is also in the wider field as well, these are copies of the Raphael cartoons. And there’re only a handful of sets that still survive. And of these sets that survive, ours is the only one which survives intact as a set. 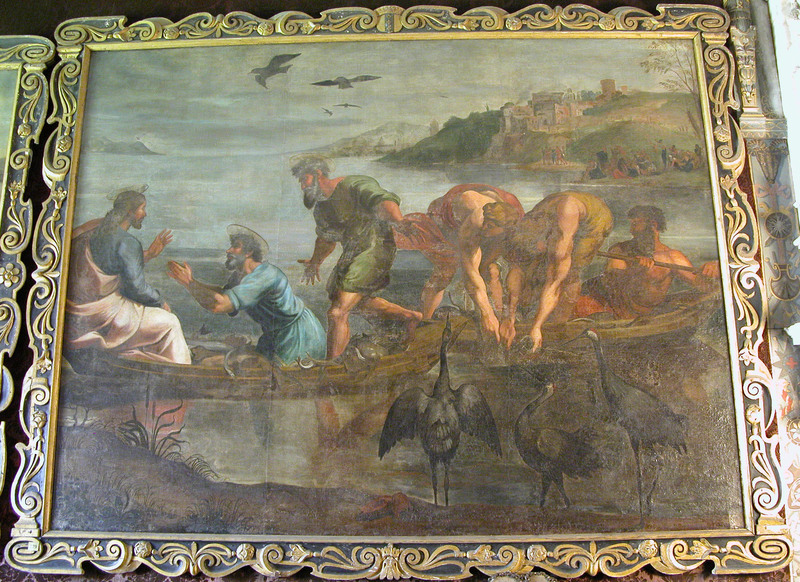 The others have been sold off at different times so it’s quite unique to have six paintings which are from the same period. They’re also significant because they are copies of the Raphael cartoons – which were, if we take ourselves back to 1635 when King Charles I buys seven cartoons and he brings them back to England. This is the first time that artists in England are actually seeing the work of Raphael and also the work of an Italian Renaissance artist, so it’s a big deal. So for us to have an example of paintings which were copied at that time from these paintings I think is very significant. Also because the Cartoon Gallery is called the Cartoon Gallery, so it was a time in the history of Knole when the Cartoon Gallery – which at that point was called the Matted Gallery – it changes its physical interior and some of the decorative interiors remain the same, but there are significant changes; and they’re brought about by the introduction of the Raphael Cartoons to that gallery. Their significance in terms of the conservation treatment is that they have been in very poor condition for many years. 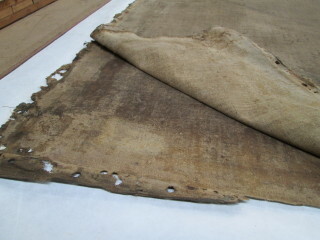 When you consider the sheer size – just undertaking any conservation treatment is a major undertaking. We considered that opportunity several years ago, when Knole was going to be part of – I think it was called something about the Treasure Houses, there was Knole and I think Hardwick, I forget the others – the idea that we put the great houses of the NT and get some money. Never happened. So now with this HLF bid, which has been successful, and additional funding it’s the opportunity to conserve the paintings. We’re learning a lot about them just by the fact that they’re now in this studio. So we know, for example, or we think we know, that they were probably lined in the early 18th century – because of the type of lining canvas – we’re speculating that that’s what happened. And it’s logical because that would have been well over a hundred years after they were painted. They’d been transported from one property, Copt Hall to Knole – you think of possible damage – so it’s possible that was the first conservation treatment. We’ve also discovered on some of the canvases, 19th and early 20th century lining canvases, which again means that at some point during that time, the paintings were restored. And we assume it had to be at Knole because it’s impossible to get them out of the house without rolling them up. So if we assume the last major treatment was some time in the 19th century, again it’s been well over a hundred years since they were conserved, and it shows. You can see the paint layers are lifting, the varnish is very discoloured; there are lots of areas where the original paint losses have been re-touched – and in some cases completely over-painted. So we’re hoping that in the cleaning process, we’ll reveal more of the paint underneath, so it’s a great opportunity to actually return these paintings to what they would have looked like – well more or less what they would have looked like – when they came into the house in the 18th century. This page was added by Veronica Walker-Smith on 09/08/2016. These are the most popular keywords used on the site. The more popular the keyword, the bigger the font size. View all the keywords used in this catalogue.